The shape of things to come. Container terminal at Malaszewicze. 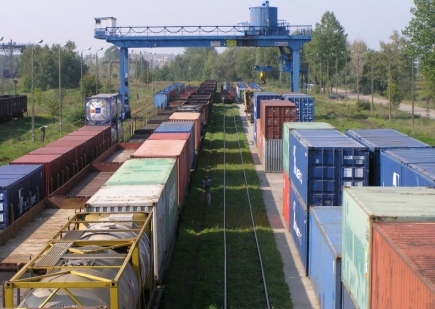 PKP Cargo has announced plans to spend PLN 405 million (91 million GBP) on capital projects in 2010. The main projects include the extension of Zabrze – Gliwice, Franowo – Poznan and Malaszewice container terminals. The freight operator also plans to upgrade its current fleet of locomotives, buy new wagons and commission a new vehicle management system. Coupled with new hikes in its rates for carrying wagonload traffic, Cargo is following the strategy of its German rival DB Schenker by focussing on the trainload and multi-modal markets. While DB Schenker is planning to develop its wagonload carrying activities in other parts of Europe, the high track access charges from PKP PLK make such business unattractive in Poland. PKP Cargo had a deficit of more than 500 million PLN in 2009. In Q1 2010, the company carried 25,51 million tons of freight an improvement of 17.6% over the same period last year and 3% more than the Q1 2010 target. The company plans to deliver a modest profit of 40 million PLN in 2010. This entry was posted on Sunday, 25 April 2010 at 04:59 and is filed under PKP Cargo. You can follow any responses to this entry through the RSS 2.0 feed. You can leave a response, or trackback from your own site.